so um, yeah. the feather save the date is a recent winner of my favorite thing ever. wrapped in a test tube and shipped in a kraft paper box ... smiles. the invite wasn't too shabby either ... box filled with moss, invite stiched to fabric and attached to wood. 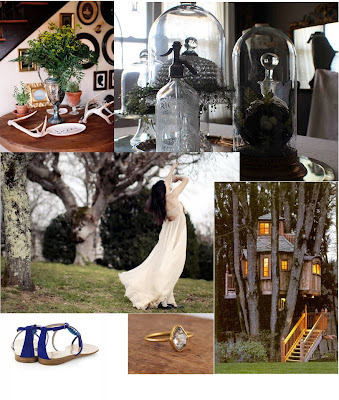 so what else would befit such and event besides a tree house, antlers and a flowy dress? Did you DESIGN the feather save-the-date??? It is AMAZING. You need to toot your own horn a little harder. maybe i'll be more clear next time .. i'm only using my stuff for ww.